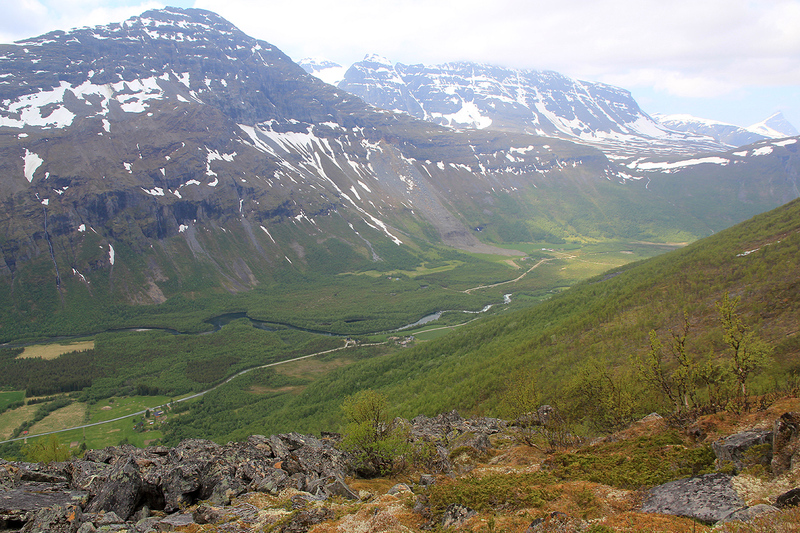 Starting from Nordkjosbotn where E8 from Tromsø meets E6, continue north on E6 across to Storfjorden, 18km. Shortly after the road to Lyngseidet has forked off left, there is a new intersection with a road going right. A sign reads Signaldalen. 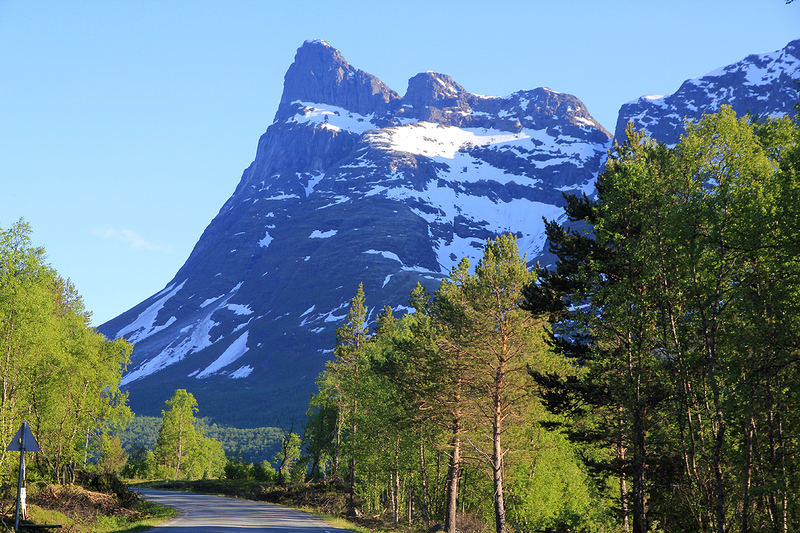 Drive 1.3 km, then make another sharp right turn following the sign for Signaldalen. From this last turn, drive 12.5 km to the farm Fredheim. I asked permission to park behind his barn. This is the trailhead, location N69:10.430, E020:01.825, elevation 80 meter. 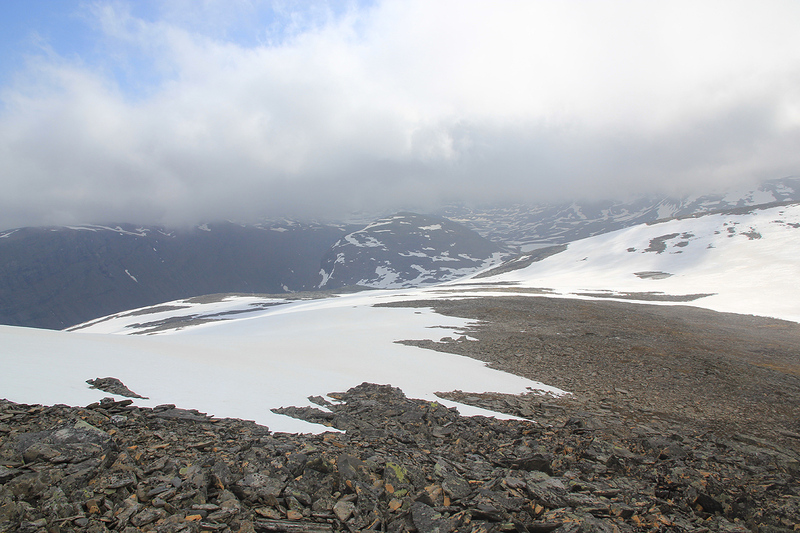 From the traialhead, locate Mannfjellelva, a rather small river that comes down just right of the Mannfjellet summit. From the farm, you look slightly left, do not confuse with the nice waterfall further right (Kortelva). Your route runs up the steep hillside, starting a bit right of the river, then gradually get closer and end right where the river exits as high as one can see it from the farm below. This route is not entirely easy, you will run into brush, steep slopes and areas with large boulders. Pick your way and get to the distinct gully where the river exits from a flat area around 930 meter of elevation. The summit is straight ahead and there is a snow gully that may be used to access the summit ridge. However, a better (and nicer) route is to first continue up along the creek, then arc more right in order to reach elevation 1230 meter near location N69:11.916, E020:03.082. 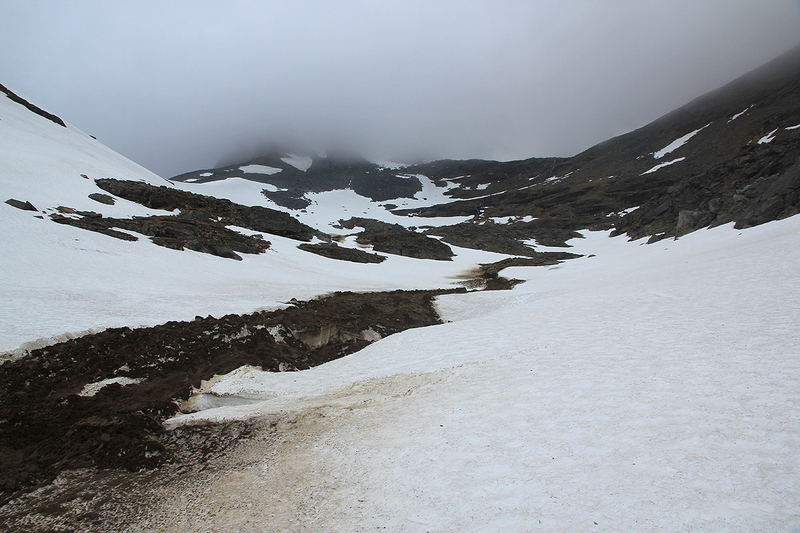 From here, aim for the lower part of the distinct snow ridge that may be accessed near elevation 1370 meter at location N69:12.106, E020:03.369. In order to climb this snow ridge crampons may be useful depending on how hard the snow is. This ridge is broad and quite gentle, slightly steeper in its lower part, then quite gentle as it rises towards the broad summit plateau that starts at elevation 1510 meter near location N69:12.187, E020:02.841. However, this is not the proper summit. 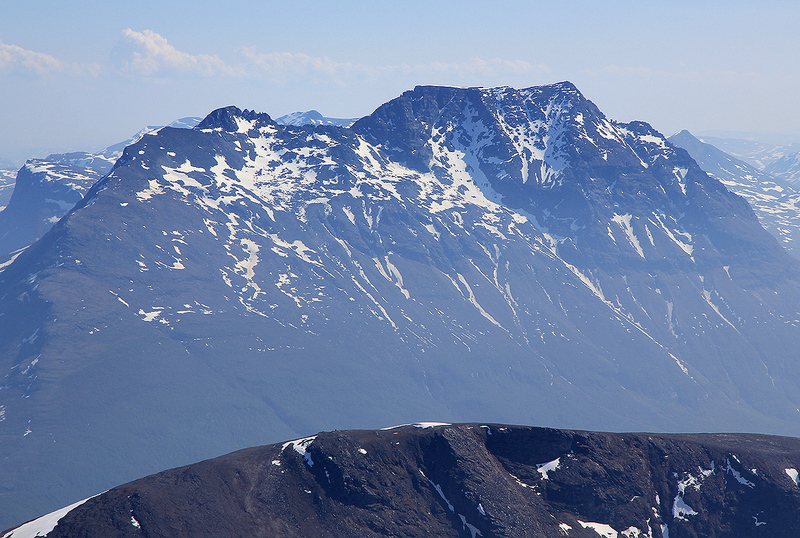 This plateau is connected to the rather distinct summit via a very nice ridge. This ridge starts at the southwest end of the plateau, it is never hard and never very sharp, a very enjoyable ridge with steep drops on either side. One may walk along the very top almost all the way, there is one small step (down) where one easily walks a bit on the right side, but there is never a need to traverse into or across any proper mountain face or slope. 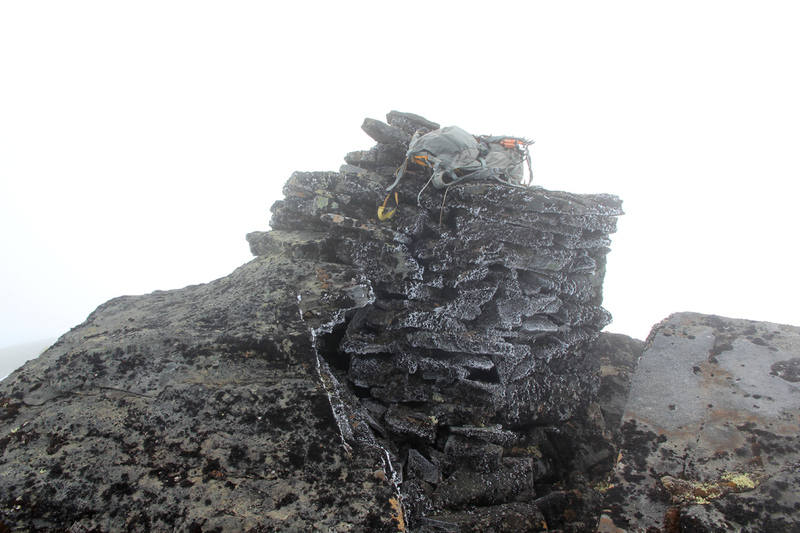 The final stretch of the ridge rises and culminates in a cairn that has been built on the very highest point. 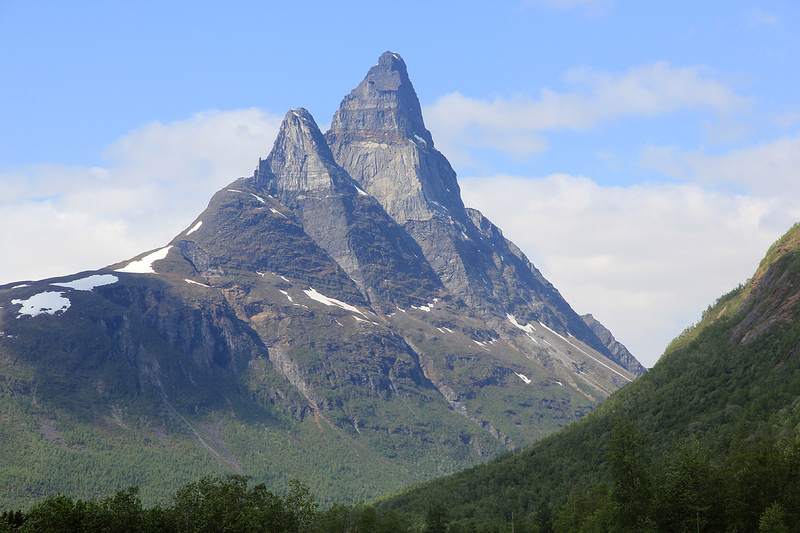 I did this climb solo the day after my very nice climb of Istind in Lyngen. After a nice dinner at Vollan Gjestestue in Nordkjosbotn, I drove to the trailhead (there is no trail!) and asked the local farmer for permission to park behind his barn. The hillside looked sort of messy and I knew I had a flight to catch back home later in the day. Thus, I slept early and had decided to get an early start. I woke up at 0330, unfortunately, the nice midnight sun was nowhere to be seen. Clouds all over the sky and Mannfjellet disappeared into the clouds. After a quick breakfast, I started out across the local fields by 0400. The hill was more or less as expected. I kept going uphill while gradually moving left. Trees and steep grass, higher up some areas with big boulders and slightly complex terrain as I moved higher and steadily closer to the creek. The terrain leveled off as I hit the top of the creek (as seen from below), around 0630, I was happy to have 2.5 hours of steepish bushwalk behind me, not exactly looking forward to the descent. I contoured left and walked on snow until near the top of a new step, still just left of the same creek. At this point all visibility was lost as I moved into the clouds. Not paying attention, I continued straight into what looked like a bowl and got myself entangled in an area with huge boulders. Such terrain should be avoided at almost any cost, since progess can slow to an essential halt. You find yourself on top of a (house sized) boulder, then after a tedious downclimb you just face the next that needs to be climbed etc. I quickly realized that this mess could have been completely avoided by going more right and therefore got myself out of the area before too much time had been lost. The terrain turned into almost flat and was easy to hike as I more carefully navigated towards the snow ridge that I knew I should climb. Here, I left my ski poles and put on crampons before heading up in a complete whiteout. The time was 0830 when I arrived on the flat plateau. With no visibility it was quite interesting to navigate towards the beginning of the final summit ridge that would lead me to the highest point. I had no idea if this ridge would involve climbing or if there would be sections where I would have to traverse off into steepish slopes, with almost no visibility I hoped that the ridge would be cooperative indeed. 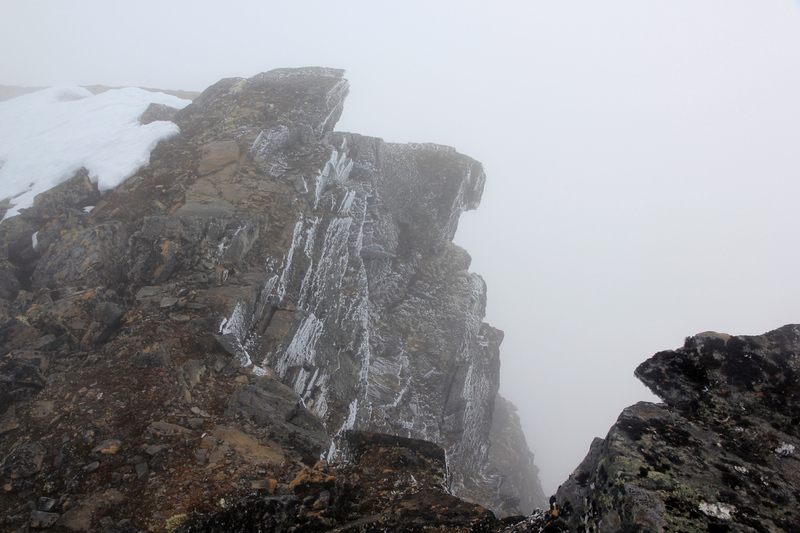 The ridge came into view and looked a bit intimidating, as rock formations often do in thick fog. The drops on either side seemed steep and the ridge itself relatively narrow as it just disappeared into the fog in front of me. As it turned out, this first few meter were possibly the most narrow section and the ridge turned out to be a very pleasant experience. Pretty broad and with good footing, I walked along eagerly exploring how the continuation would be. The ridge had a single, fairly distinct dip to a small saddle where a snow gully came up from the left, otherwise it was pretty level before a gradual rise to the summit. I arrived there at 0900, so 5 hours, but I had deliberately kept a moderate pace. The tough hikes in the two previous days and my early start today, made me hike without any hurry today. The real estate right on top was limited, in fact it was better to stay on the far side of the cairn. I stayed for 15 minutes before heading back down. The return hike followed my route of ascent. Just as I came down the snow ridge, the clouds started to lift and the sun broke through. 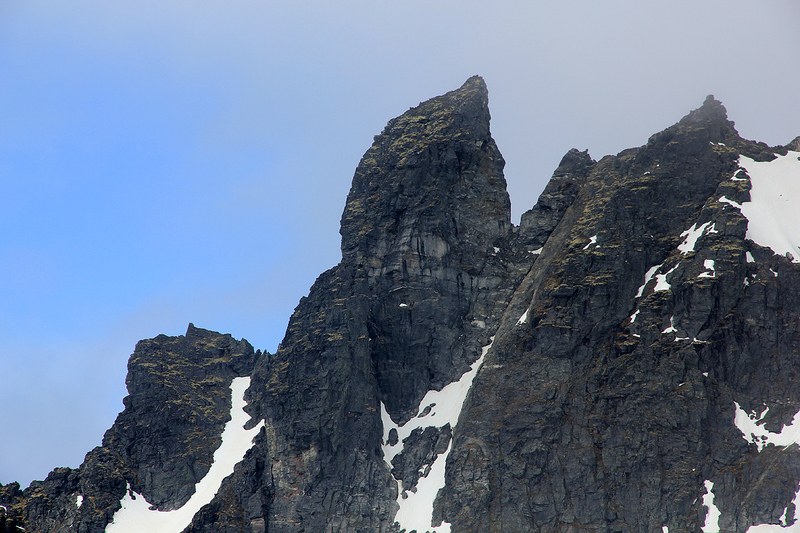 Further down, the very sharp rock formation below the summit became visible. 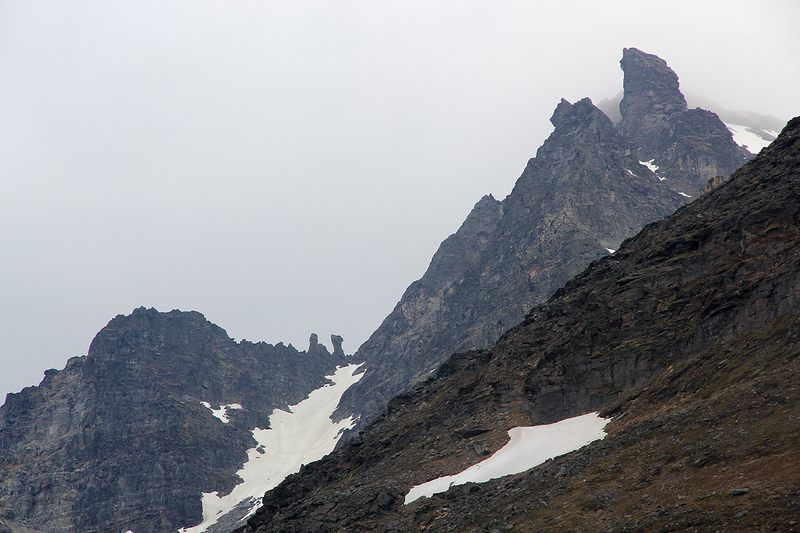 The Signaldalen valley was in clear view, but The summit itself remained in the clouds until I was back at the car by 1245. Eventually, this day also turned cloudless and nice, but I could not have climbed this late and still made my flight. I flew home at 1840 observing that the queen of Norway had the same idea, a quick trip to Northern Norway at a time of year when it cannot get much better. Midnight sun and warm weather, nature explodes while catching up after a long winter. The flight was overbooked. 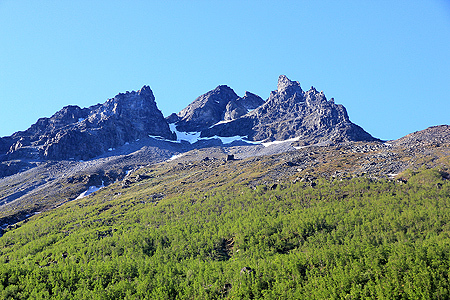 Mannfjellet, as seen from Biellogaisa. The cairn, on the very top of Mannfjellet. 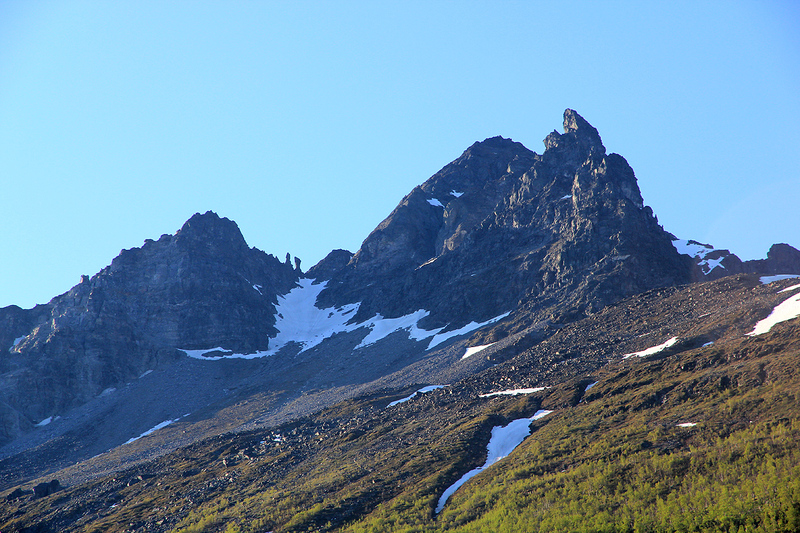 Otertinden, at 1354 meter, one of the most characteristic mountains in Troms. This view is from the trailhead looking down the valley. 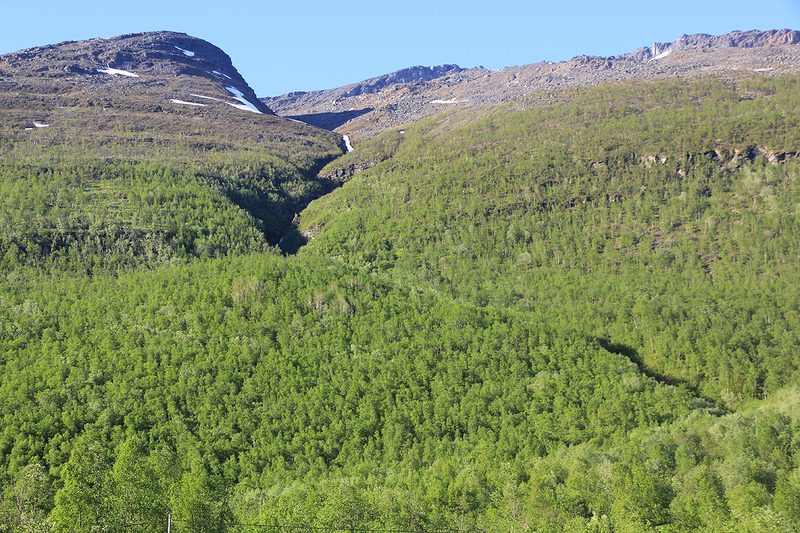 Otertinden, as seen when entering Signaldalen.